I bought these speakers in 1992 when I was in the 7th grade. Yes, it was a very impressive and expensive purchase for me at the age of 12 or so (approx. $750 for the set if I recall correctly). They’re still playing music in my home today! They even survived my college dorm, and trust me, they got tested and abused during some of the parties. Probably the best purchase of my life. Awesome looking speakers and they still bang today. Not a single problem with them. I’m just now considering buying an amp to power them properly instead of using basic stereo receivers. Proud to be a 701 Series One owner for almost 25+ years. Only weakness is that the Bose name has been tainted by Bose haters...you have to be crazy to give these speakers a low rating. I'm coming a little late to the party here about Bose 701's but they do come up for sale quite a bit so this information is for those obviously who are considering buying a pair of used Bose 701 speakers. I'm am an audio enthusiast, not an audiophile, but was told from a recording studio owner after listening to various recordings that I had a fantastic ear for sound. I use to work for Circuit City back in the mid 90's and got to actually take speakers home, except they didn't carry the Bose 701's so I had to go to Frys and "buy" them and try them out, so I would hooked it them up to my brand new HK PA2400 with 170 watts rms going through an HK PT2300 preamp/tuner. I also at this time could borrow speakers from Circuit City, and I would connect several different Bose speakers and other speakers and A/B them back and forth. The worst sounding speakers I heard were the Bose 701 and the Bose 901 (which Circuit City carried the 901 but not the 701...odd). I like all sorts of music, from classical to smooth jazz to blues to classic rock to even some metal, so as I listened to a variety of music through various speakers it became apparent that the Bose 701's were very boxy sounding (901 is for a different review, while not boxy they were shallow, and yes the Bose equalizer was on). I set up the speakers according to the instructions that Bose had, I can't recall what those were now but I think they were a lot like other speakers, 2 feet from the side walls, a foot from the back wall, and 6 to 20 feet apart, I placed them 12 feet apart due to the set up of my room. Sound wise the base was not strong, the midrange was shallow and defused, and the highs were weak, there was no imaging! just sound everywhere that made it sound a bit scrambled if setting in the suppose sweet spot. I did listen to some live concert recordings and in those instances the speaker did a slightly better job than with a studio recording but I couldn't get past the inaccuracy of the sound that I was hearing. The best genre of music for this speaker was smooth jazz, where the base doesn't get too low and the highs don't get too high, so the sound doesn't stress the limits of the speaker showing it's huge flaws when more aggressive music is being played. Even with classical there are certain instruments that can reach deep base levels, and high treble levels that the 701 simply could not handle well. The speaker failed to handle fast attacking drums, they came out muddy and boxy sounding, just irritated me to no end, and highs would almost fade off to nothing, the sound of brass cymbals sounded like someone hitting a tin can is about as close of a description I can come up with, the mid end wasn't too bad, but still had some of that boxy sound like the bass but not as bad. I think some of the issue with the speakers was the wood box should have been thicker/denser/heavier and insulation added to prevent that boxy sound could have helped somewhat to make it better sounding. When I took the grill off I could see that Bose had used low end speaker designs in the construction of the speaker. So basically Bose used thin particle board for the box, failed to use any insulation to dampen sound artifacts from bouncing around inside lending to the boxy sound, and low quality speakers. The Bose 701, (and 901 as well as others they made) are not anywhere near worth the price they were selling for, and on the used market they ask too much for them as well because Bose over the years has done a better job of marketing than any other speaker company has done and people recognize the brand and think because it's Bose it's got to be good so they run out and buy it. Well don't buy it! There are people here that rave about them, but unless they took the speakers home and tried several sets by A/B them back and forth as I did they never will think there is anything wrong with those speakers and will brag about them. The best place for a Bose speaker is in the garage where the sound quality doesn't matter but you want the sound to be everywhere. So what speakers did I end up with enquiring minds want to know? I eventually narrowed it down to 2 speakers, JBL L7 and Infinity Kappa 9. The Infinity did better at classical and smooth jazz, virtually tied with the JBL on blues, and the JBL did better at classical rock and metal, the wood cabinet on the Infinity was beautiful, but the Infinity used polypropylene for their speaker material, which my experience with that material was not good, after time that material would get brittle and crack so I got the JBL, and I'm glad I did, because years later I ran into a guy who bought the Infinitys and one of his speakers cracked about 7 years after he bought it, it was out of warranty, he had to send the speaker back for repair, but then others failed eventually he gave up and bought something else. My JBL L7's are still going strong after 20 years, and evidently are highly desired because the used market is quite high on them, about 4 times as much as the Bose 701, and about 3 times as much as 901! There are of course a lot of speakers on the market, they all have different sound characteristics, you have to listen to them with music you like, not whatever music the store has; plus in a store they won't sound the same as they will at home due to different electronics, wire, and acousticals of the room, not to mention everyone's ear for sound is different, so it's best to take them home and compare with the ability to return them if you don't like them. Also if you decide against used vintage speakers and go new, almost all new speakers sold in box stores today requires a powered subwoofer, they no longer make speakers with good low base response. Lastly, those small little cube speakers called satellite speakers will pale in comparison to sound coming from any full size speaker, but if you don't compare you'll never realize there is a huge difference. For stereo listening this set is a phenomenal performer, really puts on an impressive show for two speakers when placed right. Also people have to make sure there receiver setting are correct because unlike most other speakers these run at 6 ohms and your receiver or amplifier must be notified of this manually (most.). Alot of the negative reviews out there are a result of this commen error. The direct reflecting technology works good, sometimes when playing a movie track it sounds like the surround sound even when all it is is just two speakers. There are some flaws that can be heard in the details. This is not really a detail oriented speaker in the highs, (not bad though ) but overall I am impressed and satisfied. You can't have everything. Speakers that project amazing realistic detail, usually require a sub on the side (unless your budget is limitless.). This set puts on a show! In the same price range there are speakers that will sound maybe more real in a lot of ways, but will not produce the bass and full sound that these will. So like I said you can't always have anything, but I am glad I have owned these. 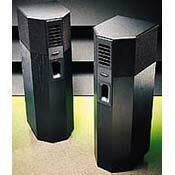 These are a power hungry speaker, give it as much clean power you can and you will be pleasantly surprised. I got a Bose 701 and I like it very much. It soounds great...looks great and added a lot of aesthetics to my home theater/music room. I'm overwhelmed with my 701 s. I have always owned Bose. The unit, receiver, you name. At the present, my 701s is juiced up by a Poineer sx 980 and I have them backed up by two cerwin v 400. No matter how loud or low I put the volume, the 701s give me the pure pleasing sound I now expect from them. Unless you have the true power that's needed to really hear how they (701s), you will never truly understand what the bad boys are really made of. I will continual listing to them until my place in heaven is needed. Until than, I'll give them five stars. This review is for Bose 701s series I with a front and rear subwoofer port. I have auditioned a pair with the front port only and the two port configuration is substantially better. The thing to remember about this product is that you must provide an adequate listening space. The speaker cabinet is a hybrid open baffle design for the tweeter and mid range which is intriguing to me. If it carried a name other than Bose, the audio community would be very interested. The sound of the speakers is very non fatiguing. I can listen for hours at moderate levels while working on paper work without annoyance or the need to readjust placement. They do not get congested in complex orchestral passages as some other speakers I have used extensively (Newform research 645's, Magnepan MG Is Improved).The treble is not as beamy as in the Bose 10.2 series 2, (considered by most to be Bose' best floor-standers) and the mid range is in fact better. Imaging is decent if you have them within 1 foot of the wall. Don't toe them in. My speakers are placed about 8 feet apart and I sit about 12 feet back. Do not have items or equipment in between the speaker pair or the channel mix is eliminated. You may also need to tune the rear base port, or the base can become overwhelming and unnatural. I use some water line pipe insulating foam to fill 2/3s of the 1 rear port. The speakers are easy to drive and they play loudly if you'd like. The full range of a grand piano is easily achieved without a stand-alone subwoofer. There is a natural weight and heft to lower register bass notes that most floor standers lack. They are decent mains for 5 channel too. I'm certain they're not perfect, but neither are $50000 Wilson Audio and I'm about $49700 to the good. Don't be afraid to try a pair if you find them used. I've A/B tested them against many other speakers and I keep returning to these. I use this speakers now for about 15 years. The were first speaker in my living room and I used them to listen music off all kind. (Classic, Jazz, Rock, Pop). They were not really neutral in sound but the lolour they put on were never brash or unharmonic but they were very precise in locating instruments. When I listen to them first I was really surprised about how fine I was able to locate the different instruments. When I bought a surround system (Canton Movie XL) the speaker were moved in my private party room. They are now the main speaker but will be supported by 2 JBL control one and a Canton AS 25 in the bar area. I used them for years without this support and celebrated a lot of parties with loud music over hours. The speakers never lost their dynamics and produced sound even on high output level without any disharmonics or even defects. I used the Yamaha AS890 as amplifier first and replaced the amplifier later by an Samson Servo 260. When you want to get something which produces the tiniest sound detail extremly neutral, than this speakers are not really the right ones. However if you are focused more on ability to locate instruments, reliability and good sound even on high sound levels, than this are the ideal speakers. this review is regarding Bose 701 serie I (same as you can clearly see in the photo attached not serie II). I have read all the reviews about them, and I have to say that I do not understand why people is talking about them with bad post. I would like to mention that I own Bose products a long time ago, in fact I grew up with good speakers since i was a child (JBL, Polkaudio, Pioneers, canton, klipchs etc...I spent thousand of € more that I could afford) and I have to say that there's no other speaker that come close to this pair in terms of power handling and clarity at high volumes leves. a point to take in account is that the sound changes at time you up the volume (the bass sound that you hear becomes tight if you need to get high volumes levels, so no distortion is heard at any volume level). the bass fills the room and the highs and mids are there for the pleasure of your ears. this pair of speakers through away any kind of music with no coloration, so if the music comes with bass they will produce bass and viceversa. the tweeters are the best sounding in it's price class they are extremely detailed and ferro fluid cooled (no so common actually). I can recall that there was a time that I turned the volume at the highest position of my amp. and the 701 were literally jumping in the ceilling. and I canoot remenbered hearing any distortion or stress, it was amazing. there's no other product in it's price range that can surpass or even equal the realism of overall sound quality and good looking, or...... excuse me....there's only one speaker that can surpass the 701 and they are only the 901 series VI (the best sounding speaker in the world in it's price class). Rely on me, you will never get a speaker like this if you handle them with a good amp / receiver (aprox. 70wat per channel into 8 Ohm with a power consuption of roundabout 300watts) better the amp better the sound that you will hear. very longlasting speakers made with good quality materials. first impression out the box was these feel lite, but they look the nuts WOW! i must say when i first heard them i loved the sound for about a month then i got really tired with them, the bass was so one noted and very slow and the trebble very detached the mid range was ok but i could never get them to sing the way my old speakers did, somebody else described the sound as like having a blanket over them and thats 100% right its a very frustrating listen, i blew a treble unit trying to get more top end from them, i was going to replace the driver myself it was to much hastle sending them back and i didnt have the boxes anymore so i pulled the mesh off the side to take the driver out( HELD ON WITH STAPPLES) they cost me a thousand pounds i couldnt believe it! i didnt replace that unit in the end i had to buy a set of interaudio to sit on top of them so i had some sort a top end,i used the 701 as subs! in the end i got fed up and got rid of the lot it all looked and sounded crap, and the 701s cabinets looked worn after 6 months and the plastic bass ports would vibrate bad, its been a few years since my experience with these i just thought id put a truefull owner review on here, i can understand why people are pissed with bose if they had a bit of build quality with the new stuff it wouldnt be so bad, because audio people can just comment on the sound which is personal preference anyway, but when people are paying stupid prices and getting build issues and the sound it must be very frustrating for these experts to sit back and know whats going on and not say anything, I LOVE BOSE FROM THE PAST,, but they will never sell me another speaker from the present!!!!!!!!!!!!!!!!!!!!!!!!!!!!!!!!!!!! !